Rainier Beach High is the third Seattle high school where students have walked out. West Seattle and Cleveland high school students walked out of class Wednesday. Following walkouts at other Seattle schools the day before, Rainier Beach High School students staged their own walkout Thursday afternoon to protest the election of Donald Trump as president. 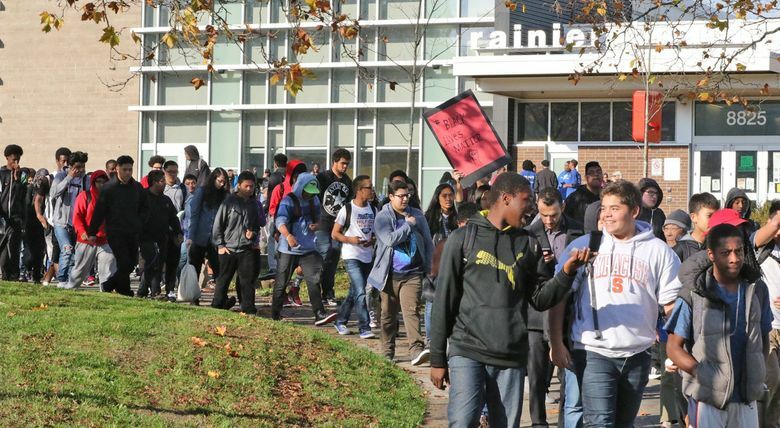 The students marched from the high school to the Rainier Beach Community Center before returning to school. West Seattle and Cleveland high school students walked out of class Wednesday. Students at other Seattle high schools have said they plan to stage walkouts next week. The walkouts aren’t sanctioned by Seattle Public Schools, but the district is working with schools to assist them in supporting students who may feel affected by the election, spokesman Luke Duecy said. The district has heard concerns from many families about how the presidential election may impact them, Superintendent Larry Nyland wrote in a letter to families. He wrote that he had heard directly from anxious and concerned families. In Seattle and other area districts, school leaders and teachers are trying to address the concerns of students, especially those who are immigrants, refugees or Muslims, and may have felt targeted by the Trump campaign. Auburn district leaders, for example, decided to have principals determine what to do at each building.